Its design comes from Tupac’s personal notebooks. This weekend in New York, diners will have the chance to eat in a restaurant of Tupac's own design. Powamekka Café will be open from April 7-9, and is being housed in Sweet Chick, a Nas-backed chicken and waffles restaurant on the Lower East Side. According to the restaurant's website, the pop-up restaurant's concept comes from "three handwritten pages from Tupac’s personal notebooks more than twenty one years ago." At the restaurant, fans of the late rapper will be able to eat meals inspired by family recipes, while surrounded by "carefully curated photographs, posters, artifacts, poetry and album covers." You can make a reservation at Powamekka Café now. 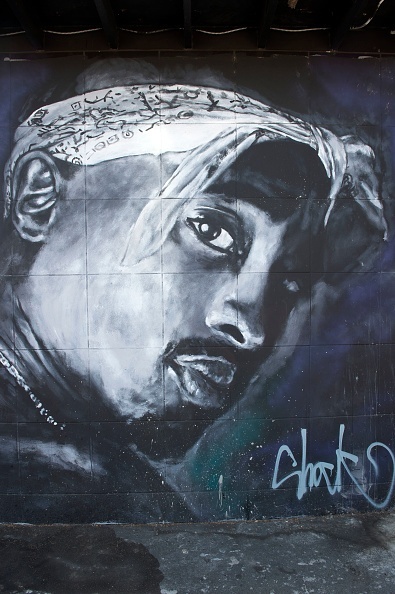 You can also bid on Tupac's nose stud.